Ed Kersey, Pratt project manager, speaks at the Wapakoneta Area Economic Development Council meeting Wednesday about the new Pratt paper mill and corrugated box factory to be built in Wapakoneta. WAPAKONETA — After seven months of planning, Pratt Industries has decided that it will begin phase one of construction at the Wapakoneta site in March of 2018, a project expected to create 100 jobs. Phase one will begin with the construction of the paper mill, which could be operational in late 2019. The starting wage for workers employed during the first phase is $25. Pratt is a recognized manufacturing company that manufactures 100 percent of recycled corrugated packaging and produces paper without cutting down trees. The company currently has 7,300 employees working in 130 facilities and distribution centers in 26 states and Mexico. At the Wapakoneta site, the company is looking to employ a group of diverse people with various skills sets, said Pratt Project Manager Ed Kersey. “If they are smart and have a good work ethic, we can teach them anything,” Kersey said during a presentation Wednesday during a Wapakoneta Area Economic Development Council meeting. Once hired on, Pratt paper employees will undergo a six-month training, where they will learn how to operate the machinery and equipment. By spring of 2020, phase two construction of the corrugated box factory will begin at the Wapakoneta site. It is expected to be built by the fourth quarter of 2022. This phase will open up 200 more job opportunities with a salary of $22 per hour. The total project is estimated at a $310 million capital investment. Kersey said that he looks forward to the start of phase one and is glad that the company chose to expand its business in Wapakoneta. 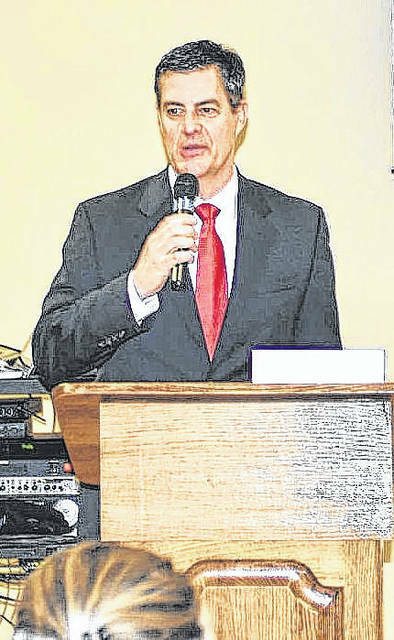 https://www.limaohio.com/wp-content/uploads/sites/54/2017/12/web1_Ed-Kersey-1.jpgEd Kersey, Pratt project manager, speaks at the Wapakoneta Area Economic Development Council meeting Wednesday about the new Pratt paper mill and corrugated box factory to be built in Wapakoneta.